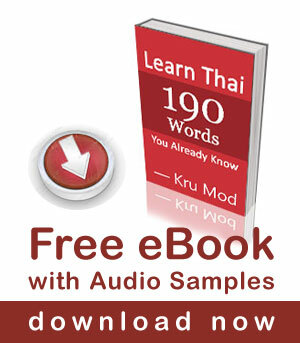 Last weekend was a long weekend in Thailand because of the Buddhist holiday – Makhabucha Day. My family and I always like to go out of Bangkok to have a short break from the big city scenery. Pranburi came to my mind although I never thought of going there because I thought the beach was not pretty. However, I decided to go and I didn’t regret my decision. Pranburi is a city in Prajuab Kirikhan province. It is an up and coming beach destination on the west side of the Gulf of Thailand, about 30 kilometers south of Hua Hin. It is still very quiet and peaceful at the moment, but I can see that it will become popular like Hu Hin in the near future. Empty Pranburi beach, perfect for a getaway. The beach in Pranburi is in Pak Nam Pran district (aka Khao Kalok meaning Skull Mountain) and it is seven kilometers long. The beach looks similar to those in Hua Hin, but the area is much less developed and feel a lot nicer. There are no vendors trying to sell you tourist stuff like other popular beaches in Thailand. There are mix of high end and friendly-to-your wallet resorts or B&B by the beach and along the beach road. Whether you come with family, a group of friends, love one or on your own, you will definitely find a suitable place for your budget. Pranburi is famous for their fresh and tasty squid. I am not a big fan of squid, but I had squid every day during my long weekend stay. There are three famous seafood restaurants on the beach road; OX Seafood, Udom Poatchana and Tonto Restaurant. I tried all of these places and my favorite is Tonto, their seafood is super fresh and the taste is remarkable – and you don’t need to worry about the cost, there were four people in my group and the bill was under 1,000 Baht. It was a very windy day. Many kite surfers were having fun. I felt asleep for awhile after reading the magazine. The sound of the waves is the most relaxing sound in the world. Besides just relaxing by the beach, you can rent a motor bike to go around the town. 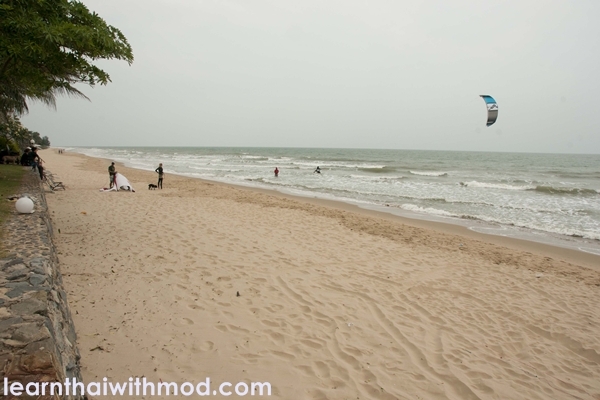 If you want something more adventurous, the beach is a very popular amongst kite surfers which looks like great fun. The Airstylers Kite School (www.airstylerskiteschool.com), offering lessons in Thai and English. I didn’t feel like flying so I just work up my sweat by walking up the hill in the small national park of Khao Kalok which has many nature trails winding up to its summit. Another activity I liked was visiting Sirinart Rajini Ecosystem Learning Center (ศูนย์ศึกษาเรียนรู้ระบบนิเวศป่าชายเลนสิรินาถราชินี). It is situated in a reforested mangrove area after initiative of the Thai Royals, which was destroyed by shrimp farming. This place set up to protect the mangrove swamps and forests around the estuary of the Pran River. I felt like I was in a different world while strolling among thousands of mangrove trees. It was completely quite, I could hear only the movement of the trees. Take Highway 4 as if you were heading to Hua Hin, except skip the traffic jams and opt for the bypass road at the 202 km mark. The road rejoins the main highway at Pranburi. Turn left at the lights opposite Tanarat Military Camp, then follow signs to Khao Kalok. If you don’t drive, you can also take a van from the Victory monument, the ticket is 250 Baht. The journey should take around 3.5 hours. that’s nice to visit and i would like to visit next time am in Thailand. Where (what hotel) did you stay? i would like to bring my brother’s famiily of 6 (wife and his 4 kids) there. Pranburi the next time.Thanks for sharing ..Good day ya! It looks like a lovely place to visit! Thanks for the tour. Thanks Mod allways so interesting!